I can’t think of a better way to kick off the chilly season than with some fun in the kitchen. 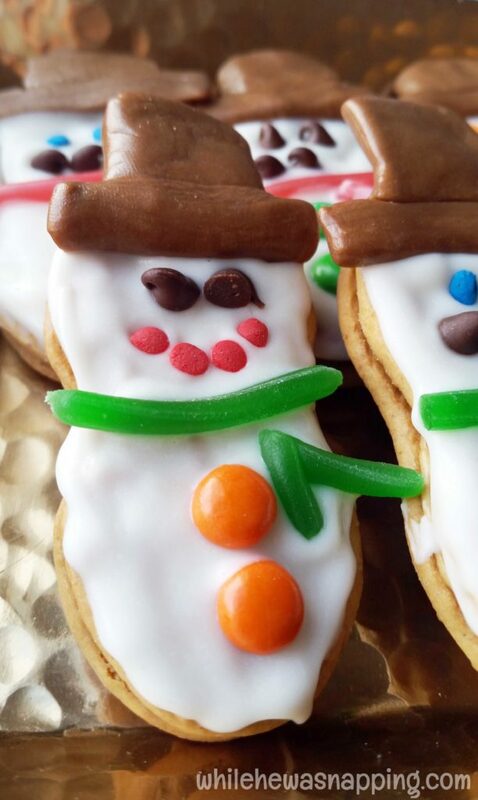 Celebrate the first snow fall, with these fun and super easy Nutter Butter Snowmen cookies! I often run out of steam and energy before we’re finished when I’m in the kitchen with my boys; so, I decided to skip the baking part and just jump right to the fun part. 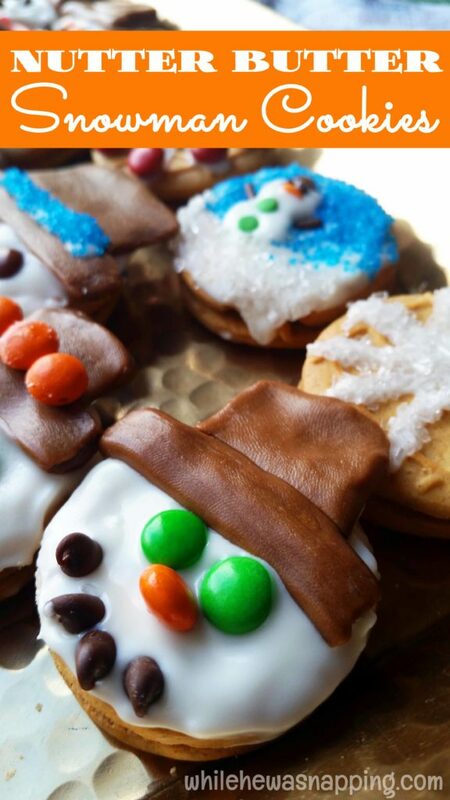 We used Nutter Butter Cookies and candies to decorate and make snowmen! 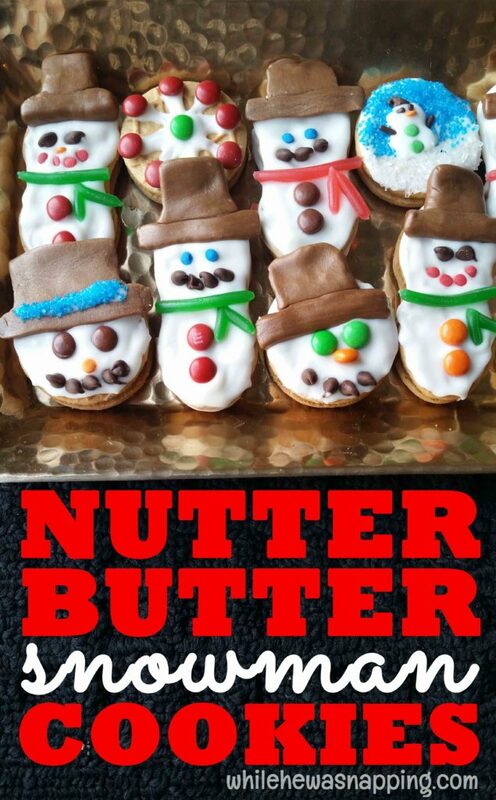 Decorate Nutter Butter cookies and turn them into a winter wonderland! 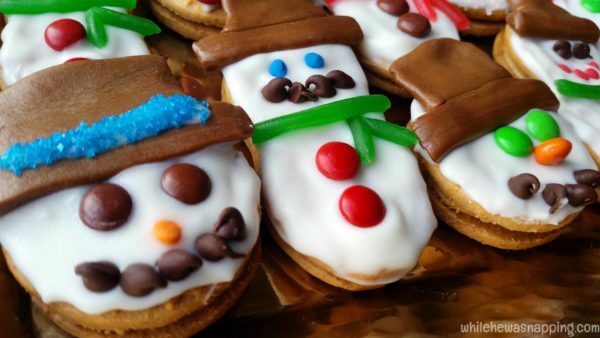 Create friendly snowmen with candies and white dipping chocolate. Work one cookie at a time so you can get it completely decorated before the chocolate hardens. 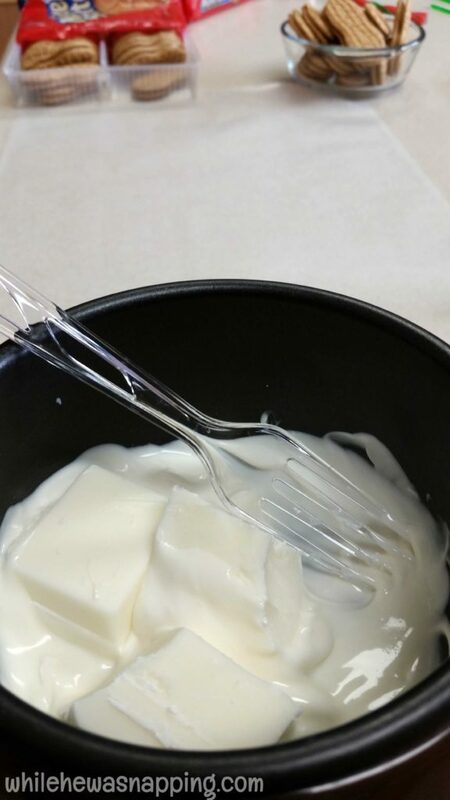 Spread the white chocolate on one side of the Nutter Butter cookie with the back of a plastic spoon. Shape the chocolate roll candies into the shape off a top hat. I actually found it easier to make several at a time and have them ready to go straight on the cookies as soon as I got the chocolate spread. Use the mini chocolate candies, the mini peanut butter candies and the confetti sprinkles to create eyes and buttons on the snowmen. The orange peanut butter candies perpendicular on the cookies made a great nose on the round snowman faces. Use the licorice to make a scarf for the snowman. The best part of these cookies is that you can decorate them however you want! Your imagination is the limit. My kids liked the snow globe, but my favorite was the snowman faces. Get creative. Decorating these cookies was a ton of fun and, while my boys ate more candy than they put on their cookies, it was definitely more conducive to the length of their attention spans. There wasn’t a long wait time while the cookies baked. We got in, got it done and moved on to other activities. These would be perfect for neighbor goody plates this holiday season. My kids loved the snow globe cookie, but it wasn’t as pretty as I had in my head so I only did one of those. My favorites were the snowman faces. I loved that the cookie decorations were trapped in the melting chocolate after it hardened. It was less messy when my kids were eating them… and that’s definitely a win. You could definitely substitute the melting chocolate for frosting too, if that is more your style. I opted to just spread the melted chocolate on one side of the cookie because I like Nutter Butter cookies as they are and didn’t want to change the taste too much. I didn’t want the dipping chocolate to overpower the Nutter Butter cookie flavor. And it cut down on sugar a little bit. I used my little melting pot to keep the chocolate warm and melted. It worked great. A small slow cooker would probably work as well. Just make sure you don’t over heat your chocolate or it will get grainy. You can also just heat it in a microwave-safe dish in the microwave in 30-second intervals until it’s melted. If you have access to a melting pot, I would highly suggest using it. It was much easier to shape several hats before I started putting the chocolate on the cookies. Then I just had to grab one and stick it on. I didn’t have to worry about moving quickly before the chocolate hardened. 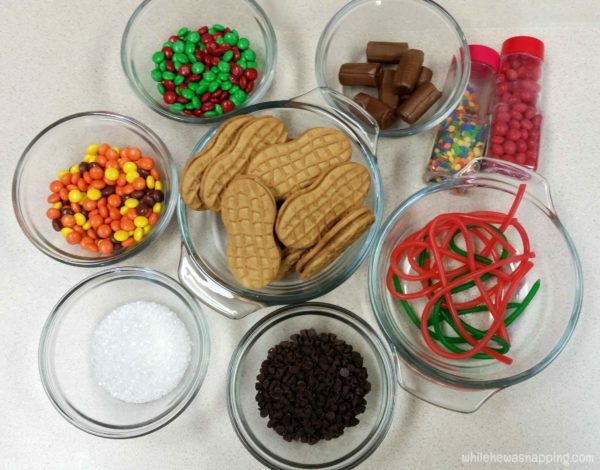 Use a toothpick to help you place the little candies on the cookies. The candies are tiny and kind of hard to position with larger hands. My boys did great if I was steadying their hands. A toothpick lets you push the candies right where you want them. Use an orange peanut butter candy bit for the snowman face nose. Stand it up on the cookie to make it look more carrot shaped and give your cookie more dimension. These are SO CUTE. I’ve never seen nutter butters decorated like that before, soooo clever!